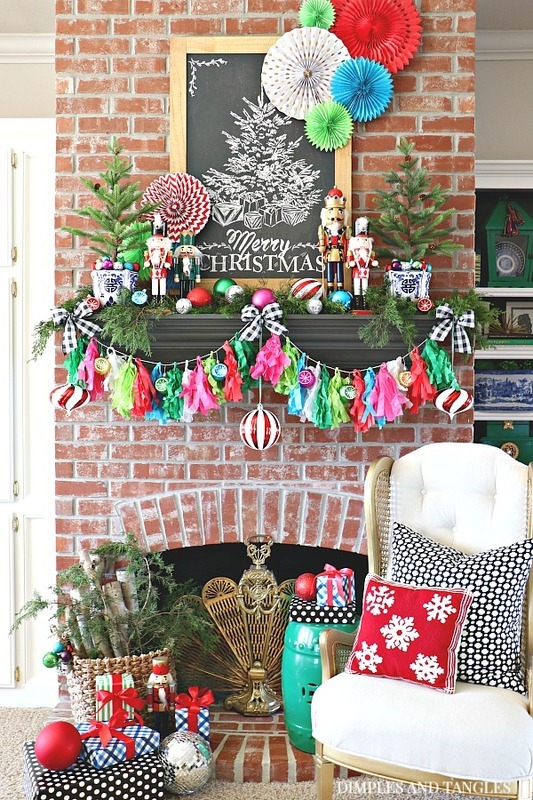 I have LOVED that artwork ever since I used it in my Christmas styling promo video with Hobby Lobby a while back, and I couldn't resist getting it to use in my own home. My husband couldn't believe it wasn't an actual chalkboard and asked if I had done the design myself. Nope! (I'm not that good!) I see so much potential for this piece in the future, too. 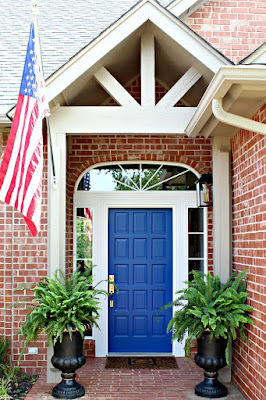 It would be great on the porch or patio, in an entry, over a sideboard, in a kid's room... so many possibilities. After adding in some things I already had and a few clippings of fresh greenery, here's what I came up with. I already had everything else shown from Christmases past or stashed in my craft and decor closet. You all know I love using these paper fans at Christmas, and I was so happy to discover the white and gold metallic set that is now available. They also have some great patterned fans in various colors, and lots of solid colored options. 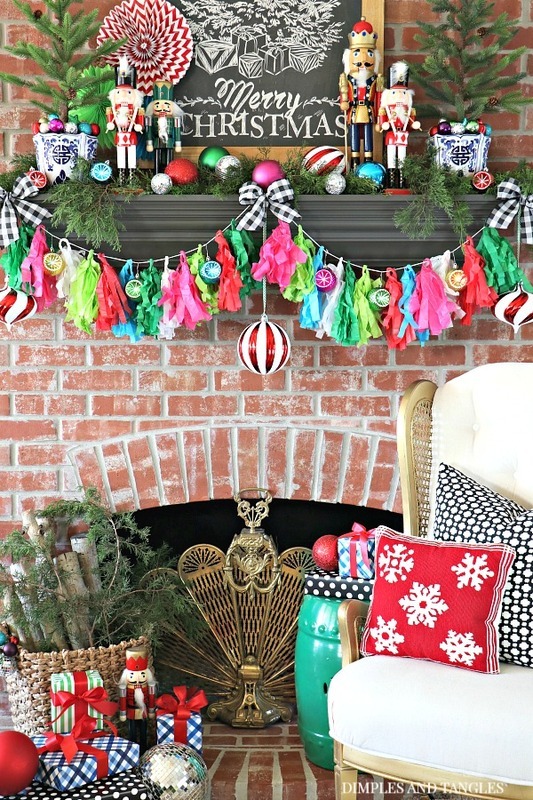 To add some fun to the front of the mantel before later in the month when the stockings are hung, I used a tissue tassel garland that I made ages ago. I have tassels in all different colors and switch them out depending on the occasion. I most frequently use it for birthdays, but to make it work for my Christmas palette I removed the orange and yellow tassels and added in a few hot pink ones. Then, I anchored the ends and middle with the large red and white striped ornaments. I keep very small nails in the outside edges of my mantel, so I can hook up a garland when desired. Command hooks would work well also if you don't want to or are unable to use nails. To pull up the middle I just used a small thumbtack. The minute I saw these trees I knew they'd be coming home with me too. The needles are actually plastic and the branches are wired for easy shaping. These are great rather than the typical nylon needled trees because they won't shed or get smashed after a few years like the nylon needles tend to do. They come in an attractive round metal base, but I slipped them in some pots I've had for years to coordinate better with the rest of my space. 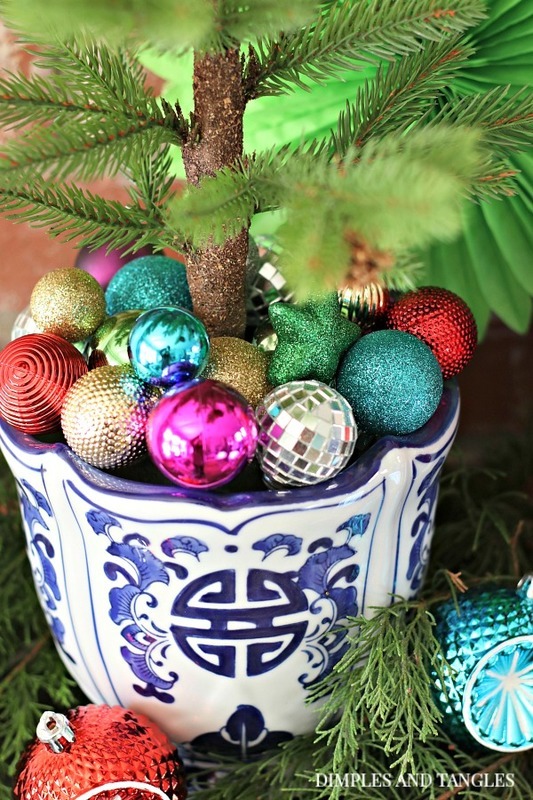 Then I filled the base with mini ornaments in my color palette, and a mini disco ball here and there for good measure! My last new addition was a pair of nutcrackers. I already had a few that I've had for ages, but have been wanting to add to my collection. Using an item in multiples always makes it more special and more of a focal point. The drummers were meaningful to add in this year since my son moved up to playing the snare in drumline this year. Now I'll always associate that memory with these guys when I pull them out each year! 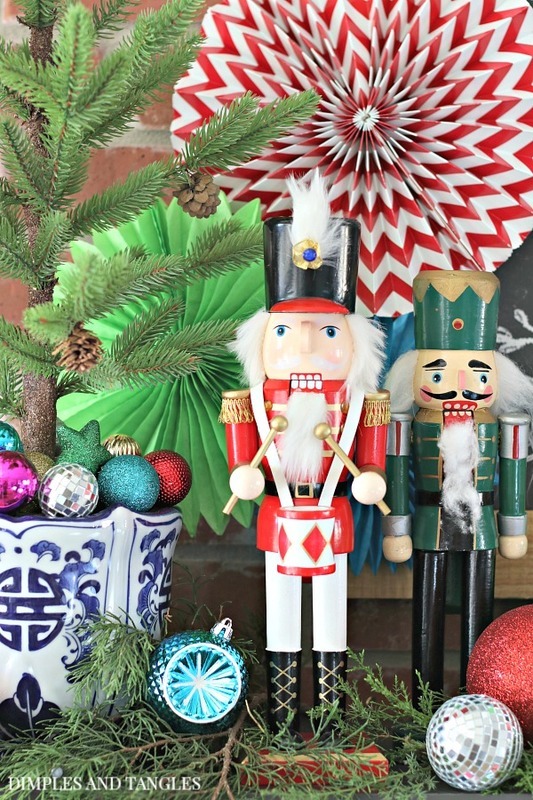 I love the base that my new pieces allowed me to build on to create this fun, festive space. And yes, all of the wrapping paper is from Hobby Lobby too. I know you have your eye on that cute blue gingham! It's in the regular party section with the other gift wrap. I already had the stripes and black polka dot, but I think they have them again this year (or very similar) with the Christmas gift wrap selections. HL is also my go-to source for disco balls. They have them in so many sizes and lots of colors this year. I added a larger one in with the gifts, and a few smaller ones mixed in with the ornaments along the mantel. If your mantel happens to be in a spot that receives direct sun during the day, get ready for a sparkle show all over your room! 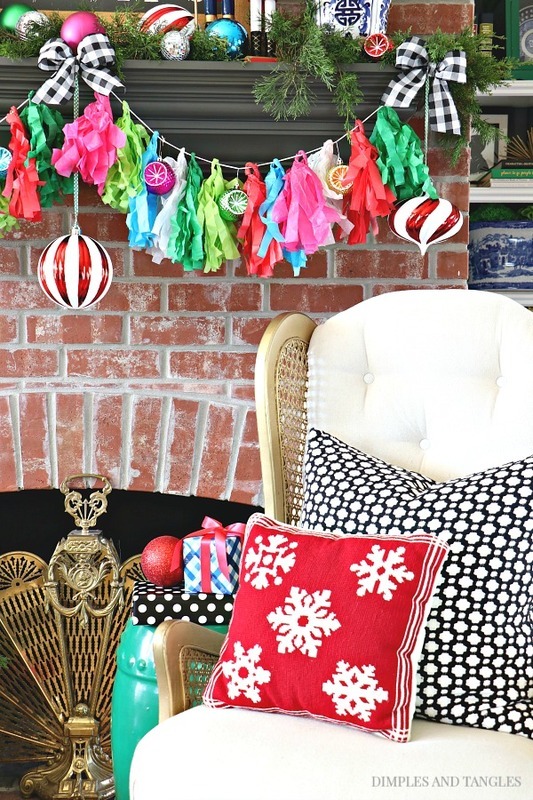 For easy sourcing, the only things pictured not from Hobby Lobby are the blue and white pots, the vintage chair and brass fireplace screen, the green garden stool, and the two pillows in the chair. 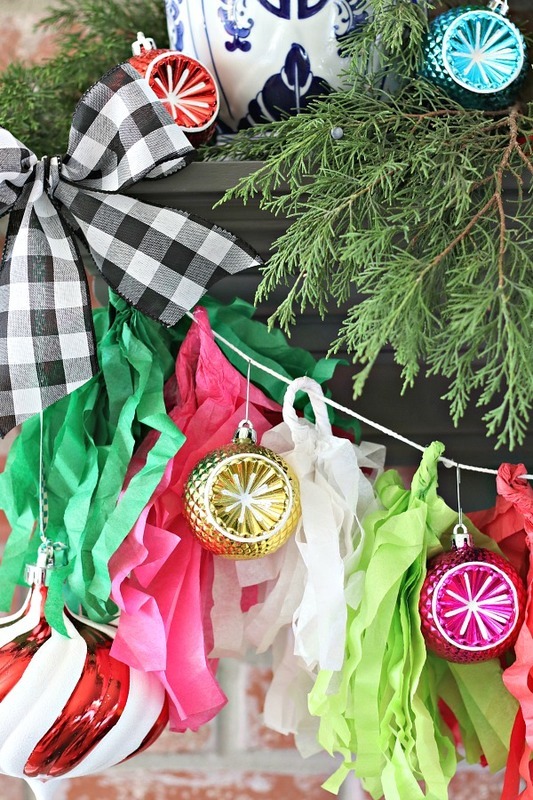 Everything else (or the supplies to make it like the tissue paper for garland) can be found in store and some online. 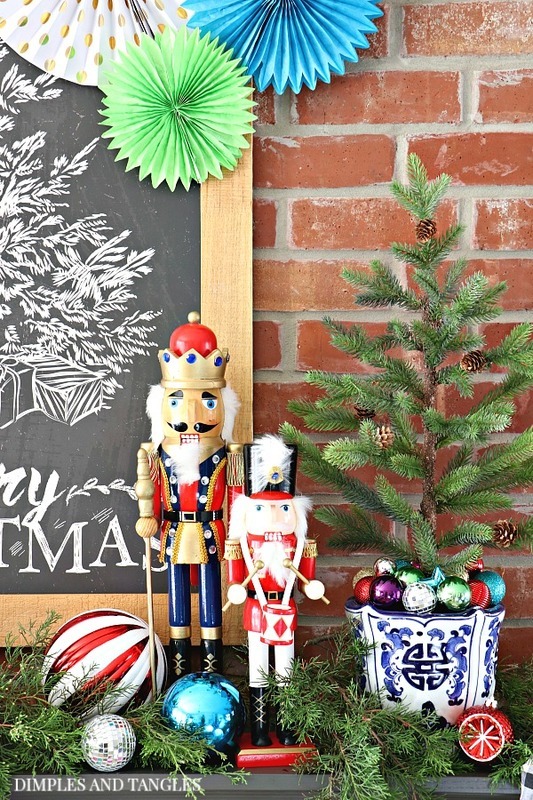 Even though I've had many of the Hobby Lobby things for years, they carry similar seasonal items from year to year so it should be pretty easy to find everything shown here. 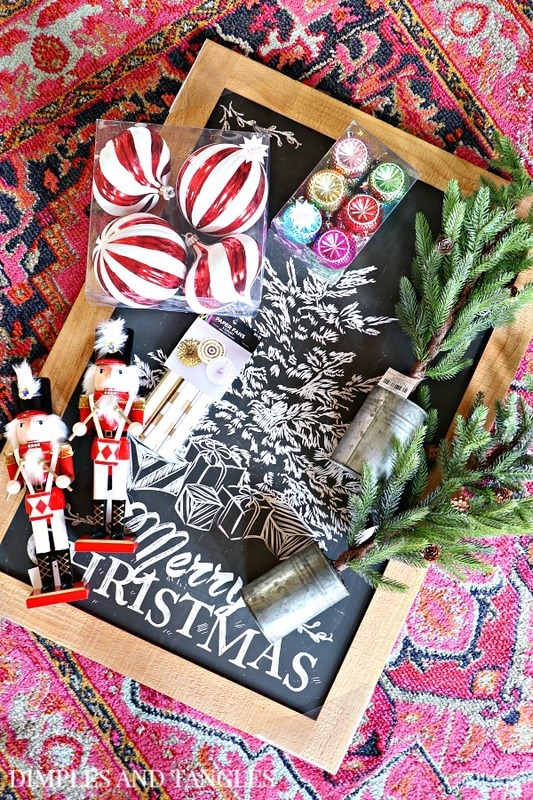 Be sure to stop in to Hobby Lobby to get your creative juices flowing for your Christmas decor this year- and hooray that Christmas products are 1/2 off this week! 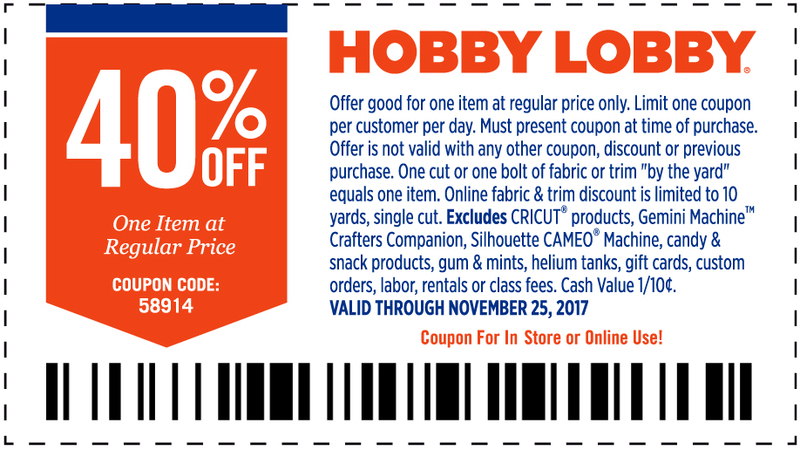 And in case you happen to find something that's not on sale, here's your handy coupon to use on a regular price item. 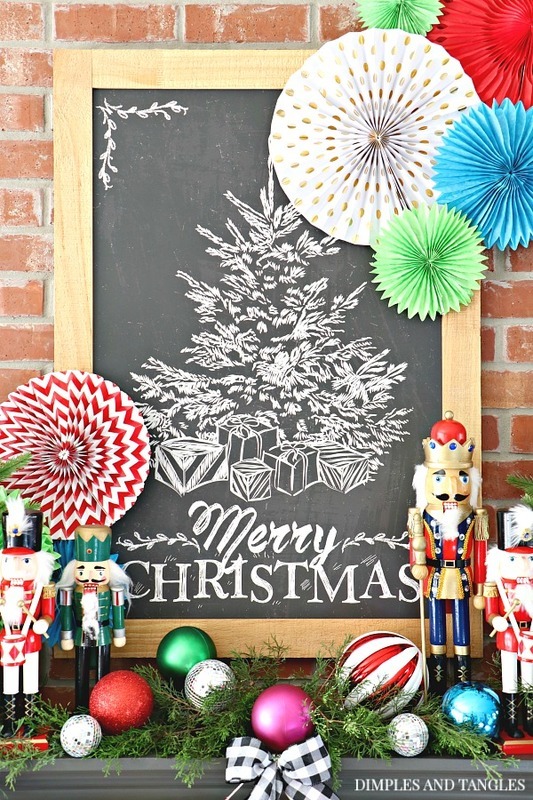 Go get your own adorable Merry Christmas chalkboard! 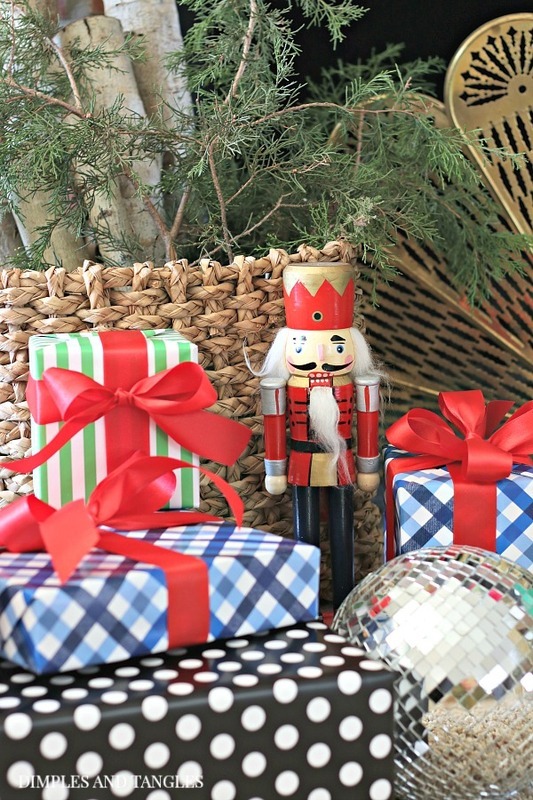 And what about you...have you been able to resist the urge to start decorating for Christmas? Or is your house already a winter wonderland? I want to hear all about it! It was so fun to get to read and look at the pretty pictures of your mantel this morning. Joyful is the best word to describe it. Love this! Getting me in the mood to decorate! 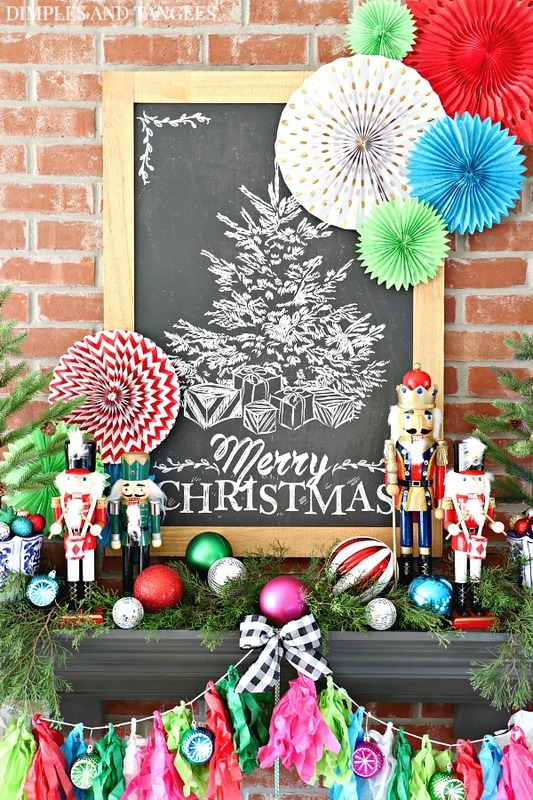 The colors look great together....and I need a merry Christmas chalkboard!!!! So pretty! 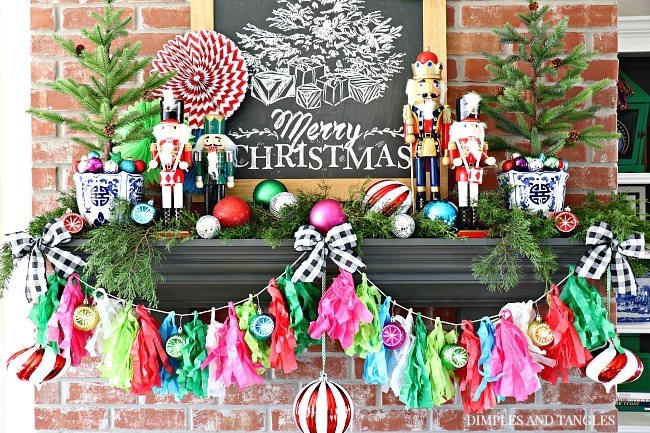 I especially love the chalkboard, the little trees, and the gingham paper. I will be headed to HL tomorrow to see if they still have that darling Chalkboard sign! How did you adhere the cute pinwheels to the brick? As usual you are full of inspiration. Oh I love it. How fun and I love how you always use fans, they are so interesting. I hope you and your family have the most blessed thanksgiving ever. 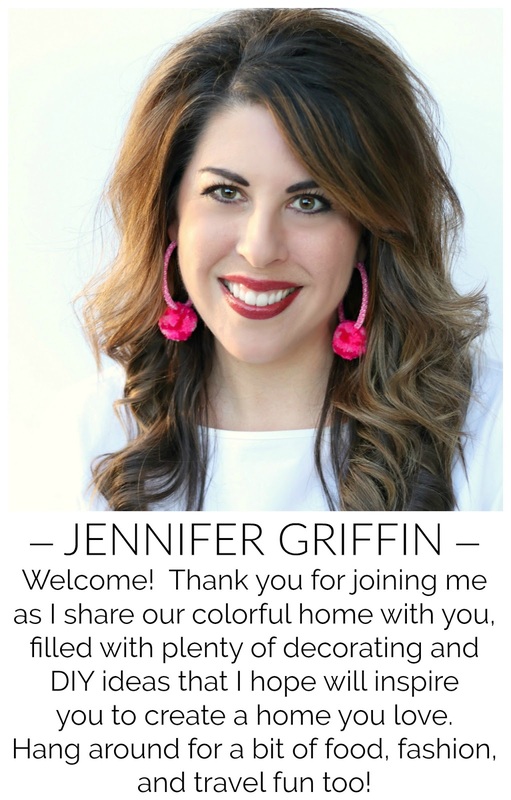 Love every little detail Jennifer! Happy Thanksgiving! Thank you for the great ideas! Love the chalkboard sign and your love of mixing patterns and colors. Very nice. This is so fun -- enough to make me want to start right now... We have a family wedding out of town soon, and I promised the husband I wouldn't begin till we got back. This makes me itchy to get going!! I was wondering -- how do you hang those fans? I have never used them, but am very intrigued with the idea. I'm ready to start too! Maybe a little more tomorrow since we'll be heading to my parents' house for Thanksgiving. To hang the fans... it depends. If I'm attaching them to a smooth surface a small piece of rolled masking tape works. If I have to attach to the brick I use the tiniest dot of hot glue (it doesn't bother me to do that). They are SO light weight that tape works well. Duct tape might work on the brick too if you don't want to do the hot glue. Once one is secured well on the bottom layer, I just use tape to add the ones on top and tape them to each other. I wanted so badly for this sign to work but didn't take into consideration the size. Great sign just way to big to go above my fireplace but of course found many other must have's for the Christmas season.